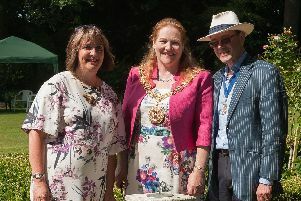 A RETIREMENT home in Southsea hosted a summer garden party, inviting residents from the surrounding area to join them. The party, which was held at Tudor Rose Court on Tuesday, June 26, had live jazz music while residents and locals enjoyed the sunshine, strawberries and cream and a glass of Pimm’s together. Guests were also given the opportunity to take a tour around the retirement apartments, which are located right on Southsea seafront in South Parade.